Your hybrid transaxle has an electronicshift lever system to minimize incorrectoperation. This means you can only shiftto other position from “P” when the brakepedal is depressed. With the following improper shifting, therejection function operates and a beepsounds so the hybrid transaxle cannot beshifted. (i) When you attempt to shift the transaxlefrom the “P” position without depressingthe brake pedal. (ii) When you push the “P” switch whiledriving. (iii) When you operate the shift lever from“D” to “R” or vice versa while the vehicleis moving. (iv) When you operate the shift lever to “B”from any position other than “D”. In case of (i), the transaxle remains in“P”. In case of (ii) through (iv), the transaxleis automatically shifted to “N”. The shift position is displayed on the instrumentcluster. Do not remove the knob on the lever. Do not use a knob other than theoriginally fitted knob. Do not hang anything on the lever. The “P” (parking) position is displayed onthe instrument cluster, and the indicatoron the “P” position switch comes on. 1. Start the hybrid system as instructed in“How to start the hybrid system” onpage 350. 2. With your foot holding down the brakepedal, shift the shift lever to “D”. Never put your foot on the acceleratorpedal while shifting. Doing so cancause abrupt acceleration. 3. Release the parking brake and brakepedal. Depress the accelerator pedalslowly for smooth starting. When you shift the transaxle to “D”while backing up, an alarm sounds andthe transaxle is shifted to “N”. 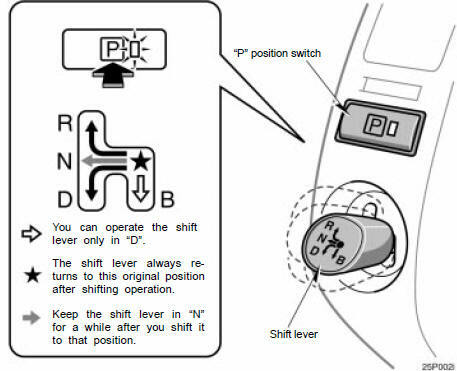 To use engine braking, shift the shift leverto “B” position. During high speed driving, you may feelthat deceleration by engine braking is lessthan that of a typical vehicle. Do not continue normal driving with thetransaxle in “B” for a long time. This maycause decreased fuel economy. To preventthis, use “D” for normal driving. When you shift the transaxle to “B” froma position other than “D”, an alarm soundsand the transaxle is automatically shiftedto “N”. Be careful when downshifting on aslippery surface. Abrupt shiftingcould cause the vehicle to skid orspin. 2. With the brake pedal held down withyour foot, shift the shift lever to the“R” position. You will hear beeps whilethe transaxle is in “R”. When you shift the transaxle to “R” whiledriving, an alarm sounds and the transaxleis shifted to “N”. 2. With the brake pedal pressed down,fully depress the parking brake pedalto apply the parking brake securely. 3. With the brake pedal pressed down,push the “P” position switch. If you press the “POWER” switch whilestopping, the transaxle is automaticallyshifted to the “P” and the hybrid systemis turned off. If the driver’s door is opened when thetransaxle is in “N”, “D” or “B”, beepsounds and a warning message appearson the multi−information display to warnyou to shift the transaxle to “P”. If you push the “P” position switch whiledriving, an alarm sounds and the transaxleis automatically shifted to “N”. Be sure to put the hybrid transaxle in“P” when parking. In “N”, the hybridbattery will not be charged even if thegasoline engine is running. You cannotstart your vehicle if the transaxleis left in “N” for a long time becausethe hybrid battery will discharge. When shifting the transaxle from “P” onthe slope, a large parking lock releasingnoise will be generated. However, thisdoes not indicate a malfunction. In order to hold the vehicle properly on anincline and for better accelerator pedaloperation at starting, your vehicle is designedlike a typical automatic transmissionvehicle which tends to move withoutdepressing the accelerator pedal with thetransaxle in a position other than “P” or“N”. With the transaxle in a position other than“P” or “N”, depress the brake pedal firmlyeven when stopped and apply the parkingbrake as required. When moving in a compact area or duringa traffic jam, it is an effective way tocontrol the speed using only the brakepedal operation without depressing the acceleratorpedal. When the accelerator pedal is released orthe brake pedal is depressed, the electricmotor acts as a generator and convertskinetic energy to electric energy to providedeceleration and recover electric energy tocharge the hybrid battery. At this time, the electric motor runningnoise may increase. The operation is the same as a typicalgasoline powered vehicle. In the “OFF” mode, pressing the“POWER” switch once or twice will select“ACC” or “IG−ON” only if the brakepedal is not depressed. In this condition,the brake pedal may move a little. This vehicle runs in combination with thegasoline engine and electric motor. If the “READY” light is on, you can startyour vehicle even with the gasoline enginestopped. In the following conditions, there is someproblem in the system. The indicator on the “P” position switchflashes. However, this does not indicatea malfunction unless a warningmessage appears in the multi−informationdisplay. All frames of shift position indicators inthe instrument cluster flash. The parking system error message appearson the multi−information display. The instrument cluster and multi−informationdisplay does not come on whenthe “IG−ON” mode is enabled. In these cases, stop your vehicle in asafe and level place, apply the parkingbrake securely and contact your Toyotadealer immediately. After you reconnect the 12 volt battery,shift the shift lever to “N” and confirm theshift position is in “N” when the “IG−ON”mode is enabled.